Police horse study: Increases trust, authors say. 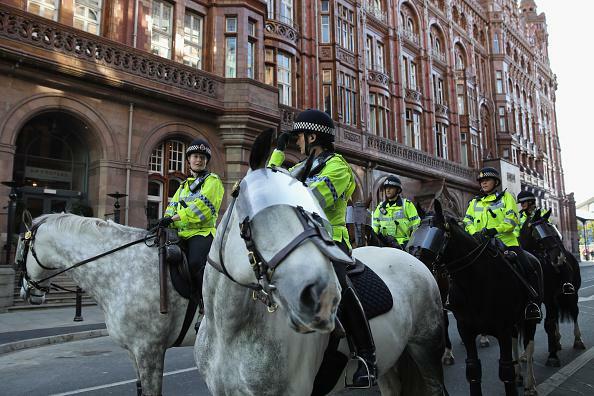 Mounted police in the U.K.
Public surveys also tested whether the mounted unit patrols had an effect on public trust and confidence in the police. The researchers found that the use of mounted patrols had a bolstering effect on trust and confidence in the trial sites, when compared to opinion in three control sites that did not receive mounted patrols. The size of this effect amounted to a greater than 10 percentage point shift in opinion, on some measures. The researchers found that horses act as an ice-breaker—officers on horses had six times as many interactions with pedestrians as officers on foot. These interactions “tended to be very friendly.” The mounted patrols also had the effect of generally increasing police visibility, and “many people react positively to greater police visibility in their neighbourhood,” the researchers wrote. One time, at a Phish show outside Boston in September 2000, my friend Keith and I saw a really sketchy-looking sketchball dude get chased down and just, like, straight taken out by a police horse in the parking lot. I don’t think that guy liked the officer who was on the horse, but there are exceptions to every rule.